K-pop girl group DIA's member/actress Jung Chae-yeon talked about working with actor Ji Soo and JINYOUNG of K-pop boy group B1A4 for the upcoming drama series. 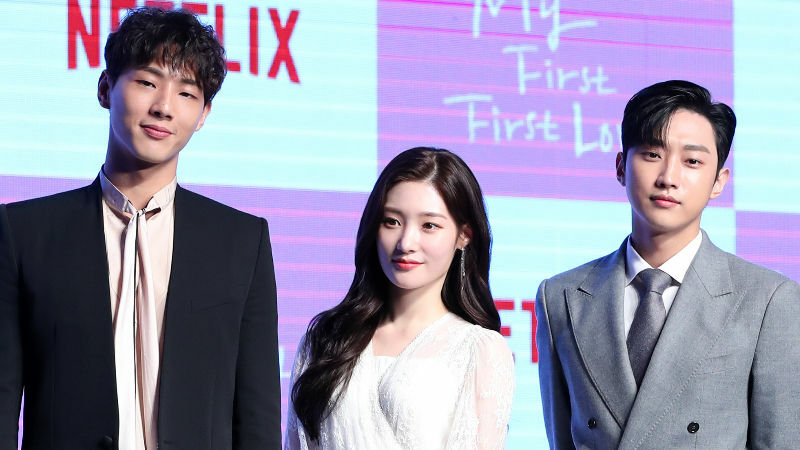 On April 12, press conference for the upcoming Netflix Original Series 'My First First Love' took place at Conrad Seoul. Jung Chae-yeon took the female lead role 'Han Song-yi', who has a hard time choosing between her boyfriend 'Seo Do-hyun' (JINYOUNG) and her childhood best friend 'Yoon Tae-oh' (Ji Soo). When asked about working with the two actors, Jung Chae-yeon said, "Ji Soo and I appear as friends, who have known each other for almost 20 years. I thought that we should actually have to be close in real life to naturally depict the close friendship in the drama. Thankfully, we were able to become closer with each other quickly." She continued, "Just like his character in the drama, JINYOUNG was very sweet to me in real life. I really didn't have a hard time filming with him." Meanwhile, 'My First First Love' will be released on Netflix on April 18.